Providing you the best range of bioactive collagen peptide, fish collagen peptide, collagen peptide/ hydrolysed gelatin, whey protein 35%, agar agar powder and dried yeast powder with effective & timely delivery. 1. It promotes cartilage health. 2. It is used to reduce joint pains, improve bone health. 3. It contains aminoacids which are useful in building fibrous tissue. 4. It is used to reduce wrinkles. 5. It supports in maintenance of healthy skin. Standard Packing : 25 Kg Laminated PaperBag or HDPE Drum. Storage : Hygroscopic in nature, store below 25°C and protect from direct sunlight. Collagen peptide is the hydrolysed form of collagen. It is a fibrous protein.it is synthesis by the digestion of collagen with an enzyme. It consists of amino acids that are responsible for building fibrous tissues. It is a “customized” building block of collagen. It is derived from fishes. It is the best source of collagen. Collagen from fish source are more readily absorbed in body. It is good for healthy skin. 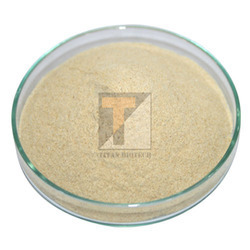 1 Appearance Yellowish to creamish colour free flowing powder. 2 Solubility (2% soln. at 90ºC) Soluble in hot water. Near to clear. Std Packing : 25.0 Kg. HDPE Drum/Paper Bag. Storage: Hygroscopic in nature, store below 25 ºC and protect direct sunlight. Agar is phycocolloid extract of Red -purple marine algae (Class Rhodophyceae) including Gelidium, Gracilaria and Pterocladia. Agar Agar Powder is a vegetable Gelatin and one with high gelling properties which is used in microbiological culture media. It has characteristics of good clarity, controlled gelling strength and melting temperature. Good diffusion capacity absence of toxic inhibitions and free from minerals. Provide moderate flow and lighting with the supplement of Iron, Magnesium and Trace elements. High levels of phosphates or nitrates will inhibit the growth of these algae. 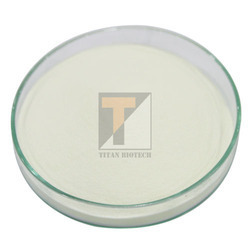 Agar Agar Powder is used clinical, bacterial and yeast transformation studies and molecular biology studies, bacteriological agar is generally used 1 - 2% for microbiological culture media preparations 0.5% for motility and anaerobes and microaerophiles require 0.1% maximum. Agar Agar is a gel at room temperature, remaining firm at temperature as high as 65°C. Agar Agar melts at approximately 85°C, a different temperature from that at which it solidifies, 32-40°C. This property is known as hysteresis. 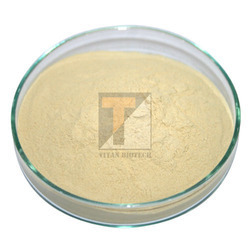 Agar Agar Powder is generally resistant to shear forces; however, different agar may have different gel strengths or degrees of stiffness. 2 Taste & Odour Having characteristic Yeast odour and slightly bitter in taste. Std Packing: 25.0 Kg. HDPE Drum/Paper Bag. It is used as a Food Supplement. Some typical applications include snacks, pizzas, peanuts and many other foods where a typical yeast flavor is wanted. It has a good water binding and emulsifying capacity. 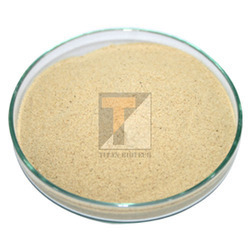 1 Appearance Yellowish to light brown colour free flowing powder. 2 Taste & Odour Having characteristic Yeast Odour. Brewer’s Yeast Protein is a good source of protein. Brewer’s Yeast is an ingredient that is used to ferment sugars to alcohol in the brewing of beer. It contains all the essential amino acids, minerals and vitamins. It is one of the best natural sources of B-complex and vitamins etc. Brewer’s yeast protein helps in enhancing disease immunity and prevention of degenerative diseases. Brewer’s Yeast is often recommended to regulate blood sugar levels, improves health of the skin, control diarrhea, lower cholesterol and repels insects. Brewer’s Yeast has been reported to help improve symptoms of diabetes and may prevent diabetes from developing in persons. Brewer’s yeast also helps in wound healing in mice. It is also a food supplement. 1 Appearance Off-white to yellowish colour fine powder. 3 Odour Characteristic, odourless without pungent smell. Storage : Store in cool and dry place below 250C, protect from direct sunlight. 1 Appearance Light yellowish to brownish yellow color, free flowing powder having characteristic odour but not pungent. Storage : Hygroscopic in nature, store the material below 25°C, protect from direct Sunlight. Dosage: 10 gm per day or as recommended for use of Formulator/Registered Medical Practitioner. Storage: Hygroscopic in nature, store below 25oC and protect from direct sunlight. Medicinal Yeast is a kind of yeast from brewer containing non-living dried yeast. It is nutritional supplement. It is single cell fungus called Saccharomyces cerevisiae. It is being used as nutritional supplement and medicinal purpose. It is good source of Vitamin B group, Chromium, Selenium, nucleic acid and proteins. 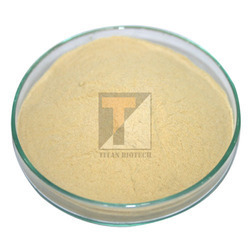 1 Appearance Greenish to yellowish colour free flowing powder. 2 Solubility (2% soln. at 25°C) Soluble in distilled water and alcohol. Std. Packing: 25 Kg, HDPE Drum. Storage: Hygroscopic by nature, store the material below 25ºC, protect from direct sunlight. 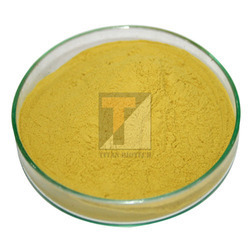 Ox Bile Powder is dried or desiccated form of Ox Bile Acids. This product is specifically been developed for Pharmaceutical Industry, which is prepared by a low temperature dehydration process which ensures a uniform product. Ox-Bile Powder, dried is a mixture of Cholic Acid, Deoxycholic Acid, Taurocholic and Glycocholic Acids and many more bile acids. It has good solubility in water, without precipitation. 1 Appearance Light yellowish to brownish yellow colour free flowing powder having characteristic odour. 2 Solubility (2% soln. at 25oC) Soluble in distilled water, clear. 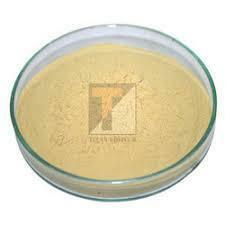 1 Appearance Light Golden yellow colour clear liquid having characteristic odour of Casein. 2 Solubility (2% Soln. at 25 ºC) Soluble in distilled Water, clear solution. 3 Taste Odour Bland in taste having no pungent smell. Storage : Store the material below 25 ºC, protect from direct sunlight. 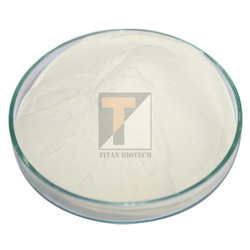 Titan Biotech Ltd is the leading Manufacturer of Protein Hydrolysate consists of amino acids and short chain peptides which represent the approximate nutritive value equivalent to casein protein, which has been derived by enzymatic hydrolysis. It provides a better source of easily assailable mixture of amino acids in a concentrated form .it contains permissible preservative. 3 Taste & Odour Bland in taste having no pungent smell. It is used as a source of amino acids in animal foods and tonics with vitamin and minerals. Correct the protein deficiency syndrome like lower appetite, weight loss, poor growth etc. Standard Packing: 55/255 kg. HDPE drum. Storage: Store the material below 25 ºC, protect from direct sunlight. 1 Appearance Brownish thick viscous paste having characteristic yeast odour but not pungent smell. Std. Packing : 50 / 250 kg HDPE drum. 1 Appearance Brownish yellow color , free flowing powder having meat characteristic odor but no pungent smell. 3 Clarity (2% Soln. at 121 ºC. )* Clear solution. No ppt. Titan Biotech Ltd. is manufacturers of Food ingredients to meet the needs of food production. Hydrolysed Vegetable Protein(HVP) is used for flavouring purpose in food industry. This ingredient adds flavours. It is produced by hydrolysing protein with Acid and Alkali. The Protein breakdowns into Amino Acid in the forms in sodium salts. It is often blend with other spices. Yellow to light brown colour, free flowing powder having characteristic Soya odour.